Browse: Home / Have you sought out a Holy Door this jubilee year? 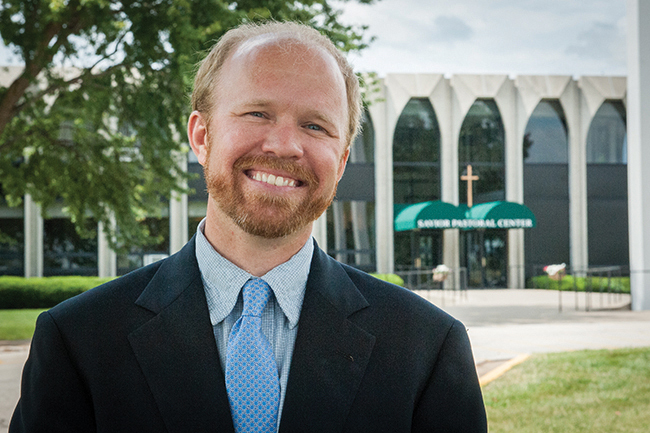 Tim Chik is the director of Savior Pastoral Center, a retreat and conference center for the Archdiocese of Kansas City in Kansas. If you find yourself with a choice of which “door” to choose, take the church door, the Holy Door, the Porta Sancta. Our wonderful and beautiful church wishes for us to enter through the Holy Door of faith and receive mercy in this special Jubilee year. Earlier this year, my lovely wife and I took our children to a few of the pilgrimage sites established by the archdiocese. It was a moving experience that I recommend to all! Of course, nothing good comes easy, and we had our share of squabbles from the kids that day. But making the effort was worth it for the family time and the chance for all of us to grow in faith and receive mercy. In Scripture we read: “Let us confidently approach the throne of grace to receive mercy and to find grace for timely help” (Heb 4:16). I don’t know about you, but I am a man in need of mercy! Our doors here at Savior Pastoral Center, while not being a pilgrimage site, are certainly open to you for grace, for retreats and events. Every day, the doors of Savior open to receive people who are looking to go deeper in their faith, renew their love for the Lord or heal their woundedness, hidden deep within. From Engaged Encounter to small men’s retreats to large archdiocesan conferences/workshops and more, Savior Pastoral Center serves the people of our community in hosting many and multiple retreats of mercy and grace. On Oct. 28-30, we are blessed to host Father Michael Gaitley, MIC, for a “Mercy and Mary” retreat weekend. This wonderful event is sold out, but all people of the archdiocese can participate by joining us in the consecration to Divine Mercy. Pick up the book “33 Days to Merciful Love” by Father Michael and you can join in this growing movement of consecration to the Lord, through Mary and St. Thérèse of Lisieux. The Holy Doors of the Year of Mercy are still open for a little while longer! Don’t miss this chance to receive the special graces available during this jubilee (which officially ends on Nov. 20). Many people already have taken advantage of this gift and have visited one of the Holy Doors throughout the archdiocese, for prayer and reflection and grace. Yet many have not. Have you sought out a Holy Door this year?